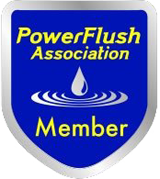 I am a sole trader providing a personal and professional power flushing service to both private and trade customers in the following areas and postcodes. Power flushing in Hertfordshire, Welwyn Garden City, Hatfield, St. Albans, Harpenden, Stevenage, Knebworth, Hitchin, Letchworth, Stotfold, Arlesey, Shefford, Biggleswade, Sandy, Huntingdon, Kimbolton, St. Neots, Luton, Bedford, Baldock, Royston, Hertford, Ware, Wadesmill, Cheshunt, Potters Bar, Barnet, Watford, Borehamwood and surrounding areas. Are there ‘kettling’ noises from the boiler? Do you have repeated circulating pump failures? Any of these symptoms could indicate that your system has circulation and flow problems resulting from internal corrosion and the subsequent formation of rust, sludge and scale deposit. 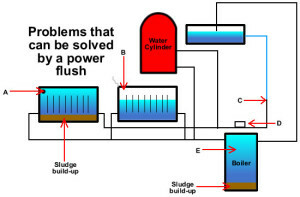 Why have your heating system power flushed? Cures flow and circulation problems. Restores heat output to radiators. Removes aggressive water; treatment prevents further corrosion. Power flushing and descaling in only one visit. 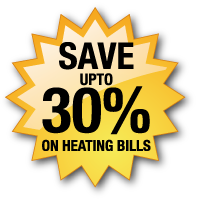 A professional power flush, lowers heating bills due to improved efficiency quicker heat up times – hot water and radiators. Radiator cold spots are cleared so that the full surface of the radiator heats the room. Increases the life of your boiler, circulating pump, valves, radiators and pipework. 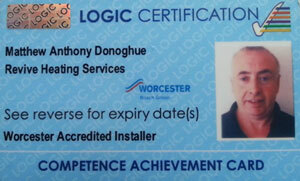 Power flushing and the adding of corrosion inhibitor, ensures that the warranty on your new boiler remains valid. Why choose Revive Power Flushing? 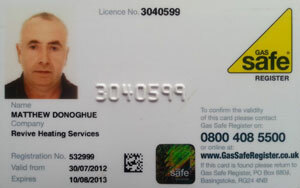 Experienced heating and gas engineer. Revive Power Flushing is a privately owned and operated business in Welwyn Garden City serving Welwyn, Codicote, Whitwell, Kimpton, Knebworth, Stevenage, Hitchin, Ickleford, Letchworth, Baldock, Stotfold, Shefford, Biggleswade, Luton, Bedford, Sandy, St. Neots, Kimbolton, Huntingdon, Royston, Ware, Hertford, Broxbourne, Cuffley, Barnet, Potters Bar, Borehamwood, Hatfield, St. Albans, Harpenden, Hemel Hemptstead, Luton.